This extraordinary DVD is packed with ideas and techniques especially for middle school and junior high choral directors, or for choral music education students. 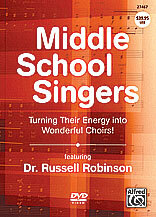 Filmed both during a convention appearance and in a classroom, Dr. Russell Robinson (along with a demonstration choir from Eisenhower Middle School, FL) shows us new and tried-and-true ways to make young and developing singers look and sound better. Learn how to take your singers' energy and put it to great use!